Workforce Capability Framework - Get it right now for the future! Is your workforce aligned to your business strategy and positioned to meet the future needs of people with disability? Aligning workforce and business strategy is critical to the success and sustainability for organisations providing services under the National Disability Insurance Scheme (NDIS). One of the biggest challenges and priorities facing service providers is attracting, recruiting, retaining and upskilling a workforce to meet the needs of people with disability. To support organisations in the changing operational environment, NDS has developed the Workforce Capability Framework. It is a robust, consistent and transparent framework that can be used to underpin all people management strategies and enhance organisational culture. identifying workforce development needs, priorities and areas for investment. Jobs across the sector have been grouped into 10 job families relevant to the disability sector. Also, take a look at the Disability Career Planner which can be found on the carecareers website. 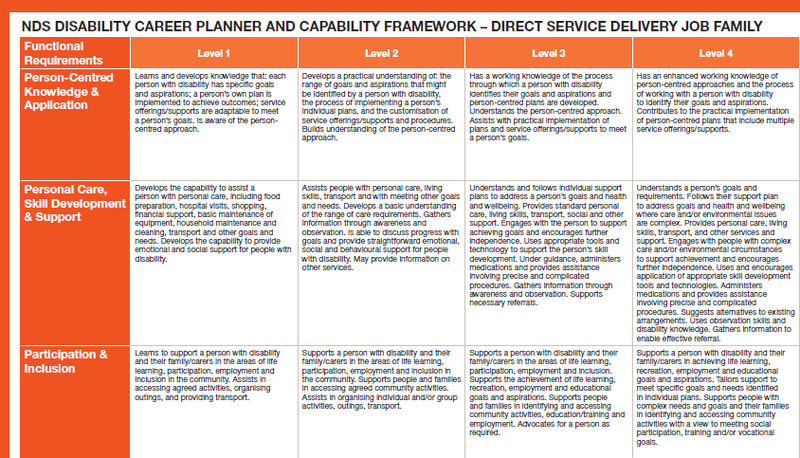 The Disability Career Planner is underpinned by the Workforce Capability Framework. It demonstrates the range of career opportunities and pathways available across the disability sector. 'So much of the work we needed to do to identify what we want our workforce to achieve has been done already through the Workforce Capability Framework'. 'The Workforce Capability Framework will not only assist us to align our workforce, it will also assist in conversations with our customers around their expectations from our employees'. *The 3-part recorded webinars were developed by NDS with the assistance of funding provided by the Australian Government, Department of Education and Training.